This is not a well written book in any sense.The book is very vague, lacks any sort of examples, and the questions at the back are worthless.It seems it was written by someone for someone who already knows the information.Oh and the questions at the back?Good luck with those, very little of the information is even referenced in the book. The title of the this review includes the words "pedagogue" for "teachers, or the art of teaching," and "pedantic" for "focus on details, often at the expense of good scholarship. 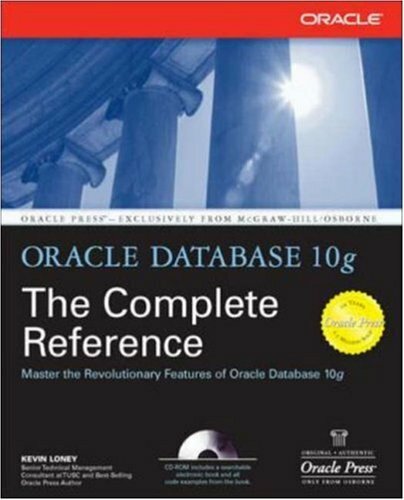 "The "70's" is for the 1970's, when Oracle was one of the premier database products available, and also for the teaching style of this book. In fairness, the writer encountered this book on implementation and administration prior to learning Oracle's database and SQL (Structured Query Language) as a user, and without a chance to brush up on modern versions of unix and linux (while Oracle is multi-platform software, these are it's current "home" operating systems). But, still:The text drags the student through several chapters of quite detailed "forest" before getting to a place where any "hands-on" learning can occur.Worse, the procedures and examples in the text don't necessarily match the way the software actually works, at least when installed on Microsoft Windows. Also:Oracle is designed for HUGE databases.The "developers license" software, installed on a home PC, consumes an incredible amount of memory and disk, and it automatically loads itself at system startup (to alter this, edit the registry, but make sure you know how to otherwise start and stop the database system first). 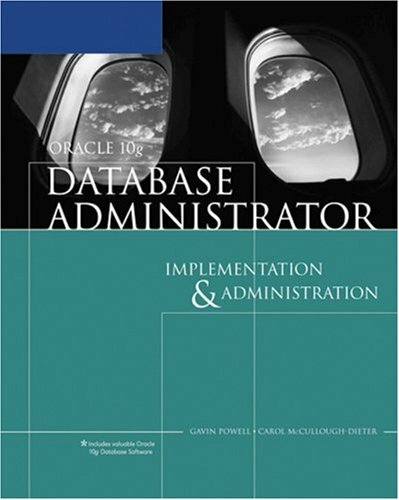 Bottom line:The book is actually a good description of the Oracle 10g Database System.However, the current version is 11g.As a text the teaching style is archaic.As a reference its organization is insufficient.If this is your choice for learning Oracle administration and implementation, this writer would recommend learning Oracle as a user beforehand, and perhaps also learning linux or unix at the command-line level. I found this text helpful and informative, but it's not exactly a thrilling read. I bought it for a college course. Chances are, if you're looking at this review, that's your reason for purchasing, too. Buy it. It's a good resource. This is absolutely the worst textbook I have ever had the displeasure of being forced to endure.The Author should be shot.Most of the pictures in the book do not relate to Oracle 10g at all, so you are left scratching your head wondering if you downloaded the wrong version of Oracle.The examples in the book ask you to perform tasks that are not taught anywhere in the text and you are forced to scour the internet in an attempt to find some assistance with the exercises.I cannot believe that my school even had us use this book at all, my only saving grace in the course was the professors and classmates assistance.Without that I would be asking for my money back for both the book and the course.This thing isn't even worth being used as a paperweight or firewood. Honestly I think Oracle should sue the author for defamation because after using this book to learn Oracle you will never want to even hear the name Oracle again. STAY AWAY FROM THIS BOOK AT ALL COSTS!!!! !I am disappointed that I could not give 0 stars for this review. Prior to this book, I had almost know experience or knowledge of the Oracle database. I really like the approach the author's used with this book. What I really want when I'm learning a new topic is to get a fairly broad, fairly shallow introduction to the material. I want the most important points summed up in a way that makes sense to a new guy. I don't want to delve deep into each topic and I don't want things explained in a way that requires me to look up and learn every other term in order to understand the points. And that is the approach the authors have taken. The point of the book isn't to make you an expert at any one area of Oracle. At lot of the book is spent discussing *why* certain features are important and how they fit into the big picture, sometimes without a lot of discussion on the features themselves. This may frustrate some readers, but I found it to be very helpful. For example, I don't need to know everything about Oracle redo logs or all the ins-and-outs of Oracle's support for business intelligence. What I *do* need to know is why the redo logs exist and a high level overview of how Oracle handles BI. This book gives you the bird's eye view of the Oracle landscape and let's you make the determination on where you need to take a closer look. The book is well written. It's easy to read, generally very clear, and does not contain many errors (I don't think I found any). Another really nice feature is the appendix containing a listing of additional resources where you can go to find more information about Oracle. These are broken out by chapter (i.e. topic). This is a great feature because it really helps with the next obvious step--digging deeper. All in all, I can't recommend this book enough. An enjoyable read with a great strategy behind it. I must admit I had some preconceptions when I picked up this book.I thought it might be a little weak on substance.I also thought it was trying to do too much, with such a broad topic.It turns out I was pleasantly surprised. For starters I read the preface.The authors work in technical sales, and the target audience is pretty broad, from DBAs & Developers to Systems Administrators and also IT managers and business users.I emphasize this because it is well written to be a good introductory Oracle book for DBAs and Developers, and not too technical that these other audiences can't digest the material.More importantly it is very well written.The style is quite good.I guess that's no surprise, being that the book is in it's fourth printing. I like the first chapter, Introducing Oracle, as it takes a stab at not only some of the history of the company, but the technology as well.I learned a few things along the way.It includes a "Summary of Oracle Database Features" which is broad and all encompassing.Sure you could probably find all of this in the documentation... somewhere!However, having it all summarized is very nice.Development Features, Connection Features, App Server, Distributed Features, Data Movement Features, Performance Features, Management Features, Backup Features, Availability Features, Security Features, and so on. Chapter two covers the Oracle Architecture, nuts & bolts, chapter three installation, Chapter four data structures, chapter five management, chapter six security, seven performance, eight concurrency, nine transactions, ten warehousing, eleven high availability, twelve various hardware architectures, thirteen distributed db, fourteen extended datatypes, and fifteen beyond the database. As I was flipping through the chapters, I was also looking for an easy way to find the 11g features.I guess I was thinking more along the lines of a New Features book, which this is not.However the book does include Appendix A, which clearly lists all the new stuff in Oracle 11g, so that fit the bill. Overall it was a very comfortable read and enjoyable.Even if you are quite technical, you will surely learn something new as the broad spectrum of Oracle is so wide, that there are surely things you're not well familiar with.However it is primarily targeted to folks new to the Oracle world, who want to dip their toes in, and learn about the family of products.And for that I would really recommend it. This book is well written and organized. 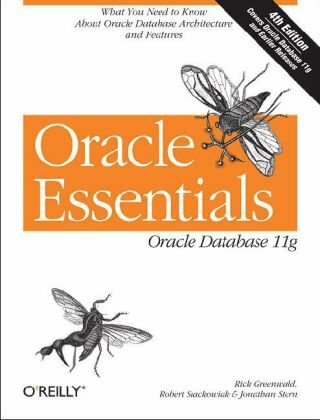 It provides a comprehensive overview of Oracle features and technologies, including the latest Oracle database 11g for begineers. The focus is on principles rather than syntax, such as Oracle security & auditing, performance, multiuser concurrency, transaction processing and high availability. A comprehensive reference for new and old users alike! This is a very detailed overview of the inner workings of Oracle. Each chapter is a small book in itself going into the detail of the subject. This might be confusing to those without a clear understanding of how databases work in general, and a background in computer science would help. Overall, the author does a nice job of explaining each topic in such a way that it would be reasonably clear either way though. There are many diagrams, tables, lists, and pictures to help explain the material. This would not be so much a reference for programming Oracle as it explains what is available in Oracle and how Oracle provides its features. The book should be usefully to Oracle DBAs and system administrators. It will also appeal to those that want a book that goes beyond stating what Oracle can do and shows how Oracle actually does what it can do. - The internal workings of Oracle are clearly explained through out. is really a complete reference. amazon service: as always - the best! Based on the reviews, I bought this book some time ago. Unfortunately, my colleagues and I have not found much use for it. It covers quite some subjects but rather briefly. There is almost half the book on SQL and PL/SQL which is too much for me for a "Complete Reference" I expected more info on configuring oracle, dataguard, ASM and Enterprise Manager but was disappointed. Conclusion for me: when I want to look up something on Oracle, I go for OTN manuals or metalink or google instead of this book. I was disappointed as a seasoned Oracle user/DBA to get abook which covers basics too much and new features too little. Not a Complete Reference. Its an end user reference. Just FYI, this book is geared at people USING Oracle 10g, not people RUNNING it. Great example- the index lists 'listener.ora' once, and its on page 34. Of over 1300 pages. And that's it- no other discussion of how Oracle listeners work, connections, database optimization, etc. This is a very basic book, not really a reference. 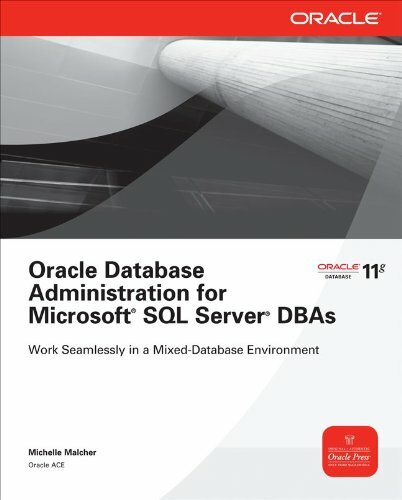 This book is a great resource for the new or experienced DBA. With so many configuration options and infrequently used features it is nice to have one source for all of this information. If you have no internet access, this book is better than nothing, but otherwise stick with the free online books and docs provided by Oracle.Indeed, the last 1/3 or so of this book is just reference material copied directly from Oracle's free docs, but is more difficult to navigate without the hyperlinked crossreferences. The book is not "complete" as the title suggests, not covering all new features (case-insensitivity using NLS_SORT, NLS_COMP is just one example). Additionally, not all the information is accurate -- the author does not even know what the term "relational database" means, he thinks "relations" have something to do with foreign keys.A common misconception yes, but worrisome from a database "expert".I also found incorrect syntax in the transportable tablespace section, before I gave up with the book entirely. Use at your own risk, and consider that the author has given his own book a 5 star rating on this site! Book came to me in great condition.I must say the shipping took longer than I expected, but within the seller's delivery range.Other than that I am pleased with my item. I needed this textbook for my current class.It was delivered before the class began and at such an amazing discount! I have been using this book or one of its earlier versions for six years. It does a great job of filling in the blanks for people like me who learned Oracle in the monkey-see monkey-do fashion of on the job training. It continues to be a great reference because it has a great index -- probably the best index in any technical book I own. I can find a term in the index very quickly and then flip to a focused explanation of that term. This usually much faster than flailing around the web doing word searches for the same information. It is an expensive book, but I have saved in frustration what I spent in dollars. It is very difficult to keep it on my desk because it is borrowed so often. Easy to understand about Performance tuning. Helpful to make idea review & investigate your oracle database. This is a very useful book for those who are looking for improving the performance of their Oracle Database. It's full of good tips that you can apply to your database. Don't you expect miracles if you want this improving overnight. I've learned that tuning is an everyday (or every week) task. It's one of those great books that give you only useful information. Very good choice, I recommend it to all people interested by performance of Oracle. Great book for Oracle database professionals who want to deepen their understanding of the manifold factors that affect performance. I learned a ton of instantly useful information during my first pass through the book. I now keep this book within arm's reach as a reference, using it frequently to address tuning issues as they arise. In my opinion, this is the best Oracle press I've ever read in its quality. The book is well organized, has extensive tested examples and the author's strong experience apparantly added to the value of the book. For those who want to be specialized in Oracle database tuning, this book is a must. Well the biggest reason for giving this a poort review is that the SQL section, the first test to be passed, in covered extremely poorly.Descriptions of the commands are limited and examples are sparse.I went through the book with the idea that this was everything I would need to pass the Oracle SQL exam ... and discovered I was wrong.The material covered here was about 50% of the material needed and the exam questions in this book, vs. the actual test, were no comparison.The real test was significantly harder.Material on the exams was not covered period, and what was covered did not really help me to understand all the 'boundary' cases that the exam focuses on. The sections covering database architecture are much better.I happen to know this material very well as this is where my day-to-day activities lie.The material was a much better match to the material needed for the test and it was reflected in the fact that nearly 2/3'rd of the book focuses on DBA topics vs. SQL. I like this book.Simple and well organized.I have been a DBA for 12 years now. But forgot many featuresin newer versions.This has everything with examples. I must read for allDBA's ! Nowadays allot of people trying to write books for fame.I believe all books are good.But when you writing a technical book its approach for the readers should be easy to understand your technical expertise. It does not mean if you have years of experience and could be a good teacher.I will not recommend book. I have known Iggy Fernandez for the last twenty years. I have always been impressed with his deep knowledge of database technology and his ability to explain it in a clear and succinct manner. He has brought that knowledge and ability to bear on this book wonderfully well. Most technical books focus on command syntax while this one gives equal importance to concepts. It is very well organized and the examples are taken from real life. "The Big Picture and the Ten Deliverables" is a very original chapter. Exercises at the end of each chapter and ample references will help the serious student. I truly wish I had this book when I started as an Oracle DBA all those years ago. I've worked with relational databases--including Oracle--for most of my career and managed teams of database administrators for many years. If you're new to Oracle, this is the one book for you. Chock full of real life tips and advice borne from a DBA who has clearly learned the hard way, you will benefit from his successes and failures. 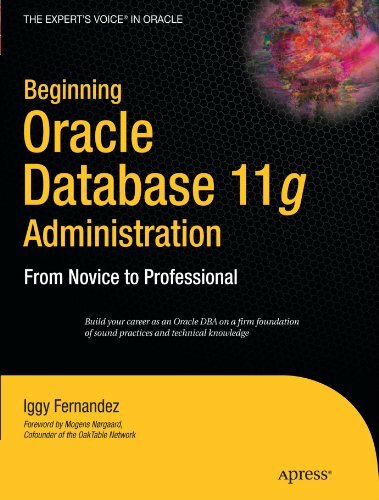 Well written and easy to understand, this book will jump start anyone who is new to Oracle or wants to brush up on DBA fundamentals. Working in mixed database environments is a very interesting challenge, both for DBAs and developers. If we already have experience with SQL Server, and need to work with Oracle, our SQL Server experience may be an advantage- we already have a good handle on what an RDBMS should do (backups, restores, etc.). On the other hand, our experience and common patterns with SQL Server may cause us to make mistakes on Oracle, because its internals and best practices are not the same. New DBAs and those new to Oracle, you'll find this book handy, but I recommend that you familiarize yourself with related topics before diving in. * Using/accessing an Oracle database. Using forms, reports, SQL, and SQL*Plus. I'm not saying you have to be an expert in these areas, but if you understand these and are comfortable with them, reading this will be less intimidating. It certainly made it easier for me. + I like this book. I have become more fluent in the terminology and I have acquired handy tools to use as a new DBA.I know I still have a long way to go too. The hardest thing I have with this is sitting down and reading it straight through. I like to read the chapters in order, but I've found that hopping around makes reading easier.For example: Things I would recommend for a new DBA (with previous experience with Oracle on the user end)is Chp 1 (overview), Chp 5 (managing Oracle instances), then even skipping to Chp 8 with administrative tasks.As these things become easy, move on to more detailed chapters about tasks and database structures.It is good (and I recommend) to know what controlfiles, redo log files, OEM, SQL*Developer are and how they can help you; but to first read details about memory structures can make reading this book and the job as a DBA seem dull and only abstract. Explore other chapters, they will reference SGA/PGA and other database architectures, but it'll be easier to vision the interaction and the dependence between applications,files and database architecture. *Everyone is different, this is a method that helped me out... and it's a method I saw throughout college. - Read other reviews and be aware that there are proofreading errors in this book! That's makes me worry that I'll misunderstand a key concept... and the reason why I'd consider giving this 3 stars instead of 4. + I don't regret my purchase.There's a treasure trove of good information here. After reading a few Oracle cert books I really, really, liked the way this book was organized. Structurally, it's written well, with cohesion, conciseness, and terms that don't seem like and endless decoupled liturgy of things to memorize. However, the proof reading and syntax issues in this book blows. It's got way too many errata issues that I'm finding as I read. And this isn't good for a book that supposed to help you pass a test and for a book that's listed at 59.95. And it's not terribly easy to find the already existing errata that's been published on McGraw Hill's web site(s) of which there are many. Chapter 5 in the book indicates that BACKGROUND_DUMP_DEST parameter used to point to trace locations. However, this parameter is now deprecated. Page 278 Chapter 7 Self Test Answers number 9. Indicates that D and E are the correct answers outing C "because there is no relevant information in V$DATABASE. However, on page 275 D in the question is V$DATABASE. D is one of the "correct" answers on page 278, yet V$DATABASE, as indicated, is incorrect. The problem is that there's a mismatch of the test question answers with the actual answers. According to the original question, the answer should be E for V$DATAFILE and for V$TABLESPACE. The answer needs to be rewritten, or the question does. Page 278 Chapter 7 Self Test Answers number 10. Discusses the DBA_TABLESPACE view. There is no such view; however, DBA_TABLESPACES exists. Also, I'm getting the feeling that the test questions were aggregated separately from its content. Which is OK, I rather like the challenge--seems more like a test. However, part of me feels that if you read the book well enough you should be able to answer the book's questions using information provided in the book. Shouldn't the author literally be able to cut and paste his own text in the answer section, perhaps paraphrased with a reference to the chapter text? I'm not seeing that at all. So do I hate this book? Not at all. It's a good read for sure. However, I'm reading it on one of those book club subscriptions and gleaning what I need. Glad I'm not paying full price for something with so many errors. I'm tired of expensive technical books with all the errors in print. If they fix the errors in this book, it could be a 5 star read and worthy of republishing. 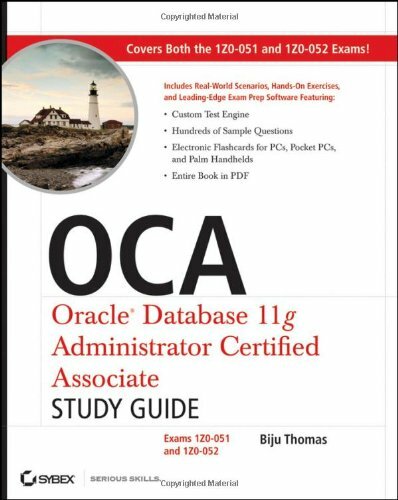 I haven't had a chance to read it but I hope it's as good as "OCA Oracle Database 11g SQL Fundamentals I" which helped me a lot to pass that exam. The books is very good for Oracle DBA certification. It has all the topics covered with clear explaination and the important tips and points for exams are also highlighted. I am rating the book 4 star. 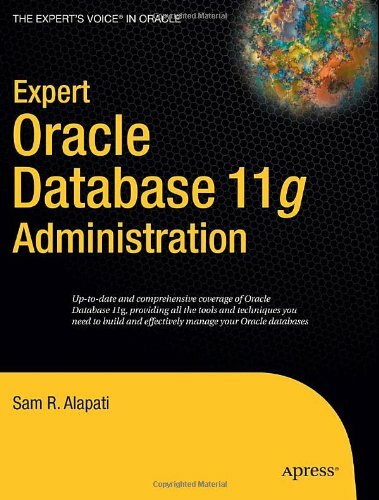 Sam Alapati’s Expert Oracle Database 11g Administration is a comprehensive handbook for Oracle database administrators (DBAs) using the latest release of the Oracle Database (Oracle Database 11g). All key aspects of database administration are covered, including backup and recovery, day–to–day administration and monitoring, performance tuning, and more. This is the one book to have on your desk as a continual reference. Refer to it frequently. It’ll help you get the job done. 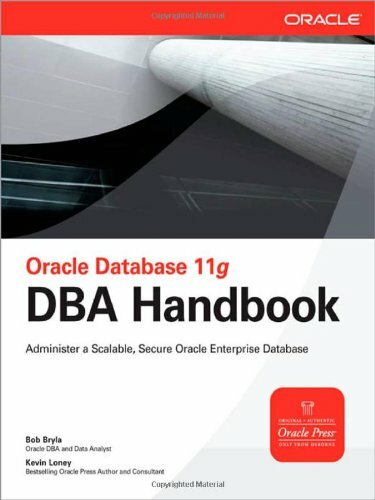 Comprehensive handbook for Oracle DBAs. Covers all major aspects of database administration. Tests and explains in detail key DBA commands. Offers primers on Linux/Unix, data modeling, SQL, and PL/SQL. Prepare an environment for Oracle. Configure the system. Install the software. Create a database. Monitor your database environment day–to–day with confidence that you will detect and resolve problems before they become emergencies. Get the most out of Oracle Database 11g by taking full advantage of its management features and cutting–edge technologies. Back up your database and be able to recover it if needed. Secure your database, in terms of both regulatory compliance and user management. Troubleshoot and resolve connectivity, network, and performance problems. Expert Oracle Database 11g Administration is written for Oracle database administrators who want a comprehensive reference to refer to during their day–to–day work. It’s clearly written in a way that is accessible to both intermediate and beginning administrators. Readers can easily and quickly find the content they need. This is a huge book, which could possibly best be described as the condensed encyclopedia of Oracle databases.The book covers everything from administration to performance tuning to using SQL*Plus to installing Oracle on Linux to using RMAN.While I did not read this book cover to cover, I did page through the book looking for interesting topics to read.I did read the author's "Expert Oracle Database 10g Administration" book cover to cover a couple years ago and was at the time very impressed with that book.There were a couple small errors in the 10g book, repeated a couple times, but I commented to a couple people that the 10g book is by far the best and most thorough Oracle reference book that I had run across.The appendix at the back of the 10g book was very effective in helping me find exactly the right topic, and usually the right syntax for just about any task.The appendix in the 11g version of the book is just about as good.It appears that the author may have rushed the job of updating the 10g book for 11g R1 as quite a few screen captures still show Oracle versions such as 10.1.0.3 and a couple other sections of the book also seem to be more specific to 10g R1 than 11g R1 (or 11g R2). 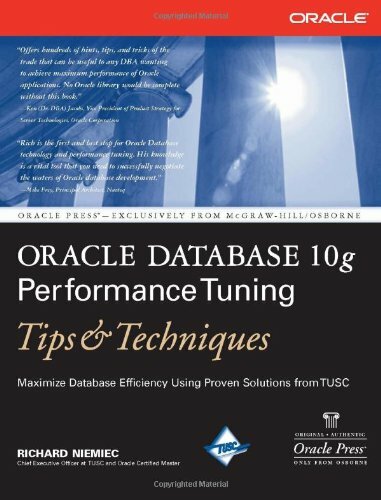 This book contains a lot of great and/or very helpful information, but while paging through the book I found a couple problems.Overlooking the problems, I would still recommend this book as a reference for Oracle 11g R1.The section on performance tuning is not my first choice for performance tuning information. Page 90 mentions RAID 0+1 but not the more robust RAID 10. Page 92 states "RAID 5 offers many advantages over the other levels of RAID.The traditional complaint about the `write penalty' should be discounted because of sophisticated advances in write caches and other strategies that make RAID 5 more efficient than in the past. "Visit www.baarf.com to see the opinions of other DBAs. Page 166 states "if you use an Oracle block size of 64KB (65,536 bytes)..."The maximum supported block size is 32KB, not 64KB, and some platforms support a maximum of a 16KB block size. Page 171 states when suggesting the use of multiple block sizes in a single database "if you have large indexes in your database, you will need a large block size for their tablespaces. ""Oracle provides separate pools for the various block sizes, and this leads to better use of Oracle memory. "For those who have followed the multiple block size discussions over the years, it should be fairly clear that it is not a good idea to use multiple block sizes in a single database.Oracle's documentation states that multiple block sizes are intended to be used only to support transportable tablespaces. Page 181 states "The database writer process writes dirty blocks to disk under the following conditions... Every 3 seconds. "A check of the Oracle documentation will quickly confirm that this is not the case. 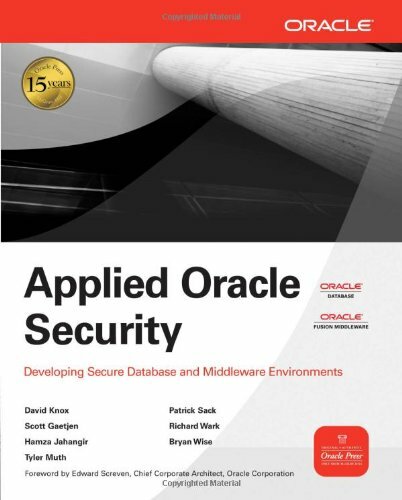 Page 182 states "Oracle further recommends that you first ensure that your system is using asynchronous I/O before deploying additional database writer processes beyond the default number - you might not need multiple database writer processes if so. "I think that I misread this several times as saying "do not enable multiple database writers unless you also plan to enable asynchronous I/O," which would be an incorrect statement. Page 190 states "this is why the buffer cache hit ratio, which measures the percentage of time users accessed the data they needed from the buffer cache (rather than requiring a disk read), is such an important indicator of performance of the Oracle instance. "The author provides a link on page 1161 to an article authored by Cary Millsap which discusses why a higher buffer cache hit ratio may not be ideal.This is definitely a step in the right direction regarding the buffer cache hit ratio, but it might be better to simply ignore the statistic. Page 190 when describing the buffer cache hit ratio states that the formula for calculating the hit ratio is "hit rate = (1 - (physical reads)/(logical reads))*100".The Oracle Database Performance Tuning Guide 11g Release 1 manual states that the correct formula is "1 - (('physical reads cache')/('consistent gets from cache'+'db block gets from cache'))"
Page 395 states "11.1.0 is an alternative name for Oracle Database 11g Release 2. "Oracle 11g R2 was just released on September 1, 2009 and its version is 11.2.0.1. Page 402 correctly (according to the documentation) states that Oracle Enterprise Linux 4 and 5, as well as Red Hat Enterprise Linux are supported platforms for Oracle Database 11g, and correctly (according to the documentation) does not list Red Hat Enterprise Linux 3.Page 403 lists the required RPM packages for Red Hat Enterprise Linux 3, but ignores the supported Linux platforms. Page 405 shows parameters that need to be set on Linux.This appears to be a direct copy of the parameters in the Oracle documentation, but the author did not include the net.core.wmem-max parameter.Note that Oracle 11.2.0.1 will require different parameters than those specified in this book, but that is not the fault of the author. Page 452 states that the COMPATIBLE parameter may be set to "10.2 so the untested features of the new Oracle version won't hurt your application. "I think that this is misleading at best. Page 466 states "If you're supporting data warehouse applications, it makes sense to have a very large DB_BLOCK_SIZE - something between 8KB and 32KB.This will improve database performance when reading huge chunks from disk. "This is not quite a correct statement, especially if the DB_FILE_MULTIBLOCK_READ_COUNT is set correctly, or not set in the case Oracle 10.2.0.1 or above is in use.8KB is the standard block size, so I am not sure why the author groups it with the other block sizes in the very large block size group. Page 477 states "the default value for the STATISTICS_LEVEL initialization parameter is TYPICAL.You need to use this setting if you want to use several of Oracle's features, including Automatic Shared Memory Management. "This is an incomplete statement as a setting of ALL will also work. Page 1055 shows the use of both CASCADE>=YES and CASCADE=>'TRUE' with DBMS_STATS.I believe that TRUE is the correct syntax, but it should not be specified in single quotes. Page 1067 states "subqueries perform better when you use IN rather than EXISTS. "The reality is that Oracle may very well automatically transform queries using IN syntax into queries using EXISTS syntax (or vice-versa), and may even transform both IN syntax queries and EXISTS syntax queries into standard join syntax. Page 1074 stated that "inline stored functions can help improve the performance of your SQL statement. "The author then demonstrated this concept by converting a SQL statement with a three table equijoin accessing apparent primary and foreign keys of the tables into a SQL statement which accessed a single table and called two PL/SQL functions (per row), each of which queried one of the other two tables which were included in the original equijoin SQL statement.This approach does not seem to be a good idea given the number of additional context switches which will result, as well as the additional number of parse calls.In short, do not solve something in PL/SQL when it may be easily solved in SQL alone. Page 1075 states "you should avoid the use of inequality and the greater than or equal to predicates, as they may also bypass indexes. "Something does not look right about that statement. Page 1089 states "the indexes could become unbalanced in a database with a great deal of DML.It is important to rebuild such indexes regularly so queries can run faster. "Interesting suggestion - I believe that standard SELECT statements are classified as DML as they are definitely not DDL.An index cannot become unbalanced, and indexes rarely need to be rebuilt - see Richard Foote's blog for the more details. Page 1089 states "when you rebuild the indexes, include the COMPUTE STATISTICS statement so you don't have to gather statistics after the rebuild. "Oracle 10g and above automatically collect statistics when building indexes, and I would assume that the same is true when rebuilding indexes. Page 1108 states that "cpu_time is the total parse and execute time" when describing the columns found in V$SQL.It is actually the time measure in centiseconds (100th of a second) of the CPU utilization when executing the SQL statement, and probably also includes the CPU time for parsing the SQL statement, but I have not verified this. Page 1154 provides a demonstration of finding sessions consuming a lot of CPU time.The example used the `CPU used by this session' statistic rather than drilling through V$SYS_TIME_MODEL into V$SESS_TIME_MODEL.The example used the `CPU used by this session' as a reason for examining parse CPU usage and recursive CPU usage.While it is good to check CPU usage of sessions, there are a couple problems with this approach.First, the `CPU used by this session' statistic is not updated until the first fetch from a SQL statement is returned to the client.If the client was waiting for the last hour for the first row to be returned, the CPU utilization will show close to 0 seconds difference between the start of the SQL statement and the check of the `CPU used by this session' statistic in V$SESSTAT - this is not the case for the statistics in V$SESS_TIME_MODEL, which are updated in near real-time.Second, the change (delta) in the statistic for the sessions was not determined - if one session had been connected for 120 days, it probably should have consumed more CPU time than a session connected for 30 minutes, and probably should not be investigated. Even with the above issues, I would still recommend this book as a reference.For specific information on performance tuning, using RMAN, or installing on Linux, it might be a good idea to use a second book for deeper understanding of the process. Lets me honest, as I have said in other reviews of Oracle 11g, Oracle 11g is a beast. There are so many new features that have been added to it in this new version that it sometimes feels that you are learning a whole new database. Yes, Oracle 11g is pretty much the defacto standard when it comes to DBMS but it can take years to fully master all its complexities. I've only been using Oracle for a few years and sometimes I still consider myself a newbie at time. So even though this book seems like a monster too (1300+ pages), it is something that no Oracle DBA or even casual user should be without. 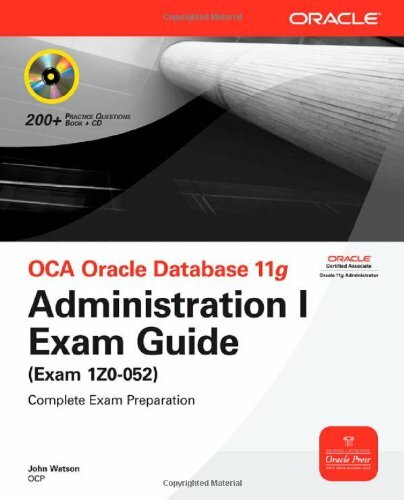 The author, Sam Alapati really covers everything there is to know to fully administer Oracle 11g and some things I didnt even know existed until I went through the book. You dont have to read this book cover to cover to fully appreciate this book's wealth of knowledge. The book is very well organized and makes it really easy to find exactly what you are looking for. Since a book this size really has to be well organized otherwise you will spend hours trying to find something. Not only is this book very well organized but is written in a way in that you don't have to be a genius to understand it. I've read so many other Oracle books that assume you have a Phd in engineering or something to understand what the author is talking about. This book explains all the topics in an easy to read and digest manner with plenty of "real-life" examples that you probably already have encountered at work using Oracle. The book is divided into 7 sections: Data Modeling, Achitecture, Installation and Upgrading, User Management, Backup and Recovery, Managing, and Performance Tuning. The author explains so much excellent information in this book than its really like getting 2 or 3 books in one. 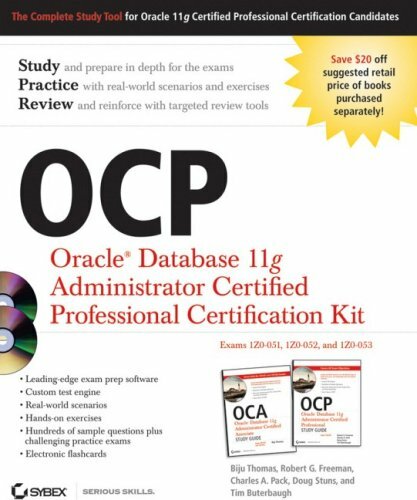 The Performance section alone is worth the price alone since many other Oracle books barely talk about this topic unless its a separate book. And the Architecture and Installation sections really explain how the new version (11g) really differs from previous versions and quickly makes you understand how much has changed from older versions. This book can also be used as reference book for getting your Oracle certifications as well: Oracle Database SQL Certified Expert exam. This is A poorly written book. The programming examples used in the book are not explained in any detail. For instance, in Chapters 3 and 4, it uses functions and procedures and other objects without providing any explanation for the benefit of those new to PL/SQL programming. I really don't understand how could a such a book be written. In places, even the naming scheme is confusing and requires an effort to comprehend. 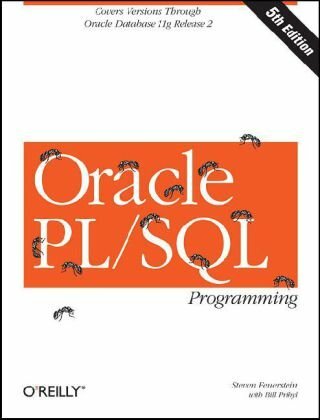 For someone who is starting out with PL/SQL programming, I definitely would not recommend this book. I "subscribe" to this author and publisher for texts on this topic.I like the writing style and layout of the book.There enough explanation to be thorough, and enough practical examples to be useful outside of pure theoretical discussion.Plus, there are plenty of references in the appendix, so those pages are essentially a "Nutshell." However, I think I prefer the layout of the 9i edition.The flow was nicer:a structured outline, then some examples.In the 10g edition, the flow seems to have changed:a briefer description in paragraph form, then a lot more examples. Let me start by stating that I agree with Frank N. Loreti's review of this book, and one part in particular: this book was not written by educators.And I would like to add that they don't seem to be terribly good writers, either. On page 72, it reads: "Boolean variables, when combined with an IF-THEN block, do not need to be provided with a comparison value if only comparing to TRUE. "First, Boolean variables aren't "combined" with an IF-THEN, they are *used* as part of the [Boolean] condition of the IF-THEN.And second, writing that they don't need to be provided is, educationally speaking, not very wise; it suggests that it's a specific feature of the language, a short cut if you will, when in fact it's a mere consequence of how the evaluation of Boolean expressions work. What happens then if v_price equals 35?Will only the first WHEN-statement block be executed?Will both be executed?Will an exception be thrown?Less likely, but not impossible: maybe a compile-time error is given? )It's hard for me to understand how any decent programmer can overlook the fact that these 'details' need to be discussed. On page 110, loops are discussed: "We cover three different types here: Simple loops.The most basic kind of loop, they include LOOP, END LOOP, and some method of EXIT. "Since 'different types' of loops are discussed, the plurality in 'Simple loops' suggests that there are several types of simple loops --and it seems they are called the 'LOOP', and 'END LOOP'... or something.Of course, this is not the case: there's only one type of simple loop.It starts with the keyword LOOP which is followed by a statement block that may/should contain an EXIT statement, and it ends with the keywords END LOOP. "As these features are demonstrated, think about how they can be used to improve the functionality, performance and design of your applications." It's suggestions like these that simply make my toes curl. I got recommanded this book. Now I satisfied my choice because of contents of this book. 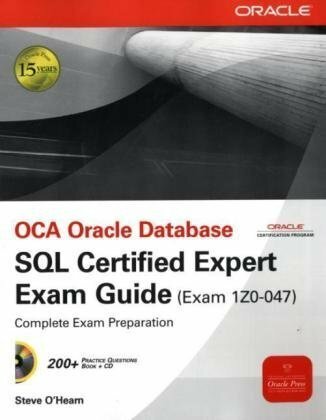 This exclusive Oracle Press guide covers all of the objectives on the newly created Oracle SQL Expert exam in detail, including control privileges, creating indexes and constraints, altering existing schema objects, creating and querying external tables, and using the advanced SQL features to query and manipulate data within the database. Oracle Database SQL Expert Exam Guide features real-world examples, practice questions, and chapter summaries to help you learn the material. The CD-ROM contains two practice exams and an electronic copy of the book. I have used multiple books to prepare for the Oracle SQL Expert exam. Generating Reports by Grouping Related Data, Managing Objects with Data Dictionary Views, Regular Expression Support, and Hierarchical Retrieval, and a few sections on managing TimeZones, Flashback, and External Tables. Although this book is comprehensive enough for the examination, I thought the topics were covered more clearly in other books - particularly Oracle SQL by Watsonand Mastering oracle SQL by Mishra. If your primary goal is to pass the exam, this book is ideal. Otherwise, study from a combination of aforementioned books. +Covers all the topics for the SQL Expert certification. +Accessible to someone new to Oracle. -The author repeats himself 3 to 4 times in each section. Steve O'Hearn does a good job delivering a very encouraging, personal (as well as informative) tone to the material.While containing much the same material as other Oracle Press SQL books, it does not lift or "steal" any of the wording.O'Hearn has opted to write everything from scratch.The book also lacks the typographical errors that have plagued so many Oracle Press books over the years. 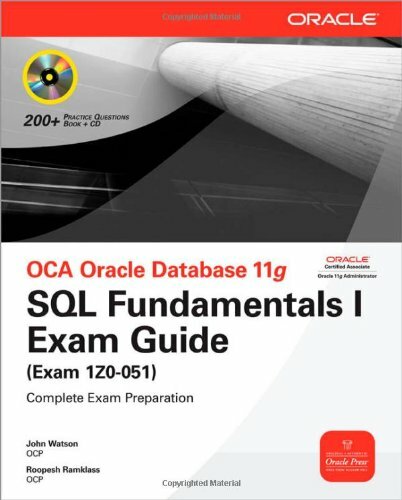 This book's objective is to prepare you for the exam.It is not an exhaustive SQL reference (though certainly robust) - nor does it claim to be.In addition to the book itself, you also have access to the ebook and additional exam simulated questions via the CD.The ebook is in Adobe and isn't formatted quite as well as the Kindle version.The ebook is baked into the price at nearly $40. There really isn't too much I would offer in the area of improvements - except to have even more exam type questions. 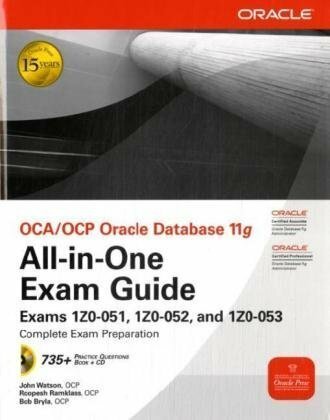 The Oracle SQL Certified Expert exam covers several topics that are not covered in books that are geared towards the SQL Fundamentals exam.It is for that reason that I purchased this book to use as a study guide for the Oracle SQL Certified Expert exam.I recently passed the exam and give full credit to the time I spent going through this book and taking the practice tests. The books assumes a little knowledge of SQL but I think it is a great guide for both beginners, and experts alike.It is well organized and has a great index.You can read it from beginning to end and it makes logical sense, or you can simply use it as a reference to look up the portions you are interested in.Because the book is geared towards passing the exam and not simply to provide more general SQL knowledge, you won't find any examples that you work on, alongside the book, as you read.Some people might find it hard to learn that way, but for me it was great.I didn't need to have a computer in front of me to try out the code to understand what it meant.This also allowed the book to focus on some of the more subtle and conceptual aspects of the SQL language and how Oracle has implemented it.I think that is key to having passed the exam.Because the book teaches the concepts behind the SQL language, instead of just giving syntax examples, it helps you correctly answer questions that might not directly relate to examples given in the book.For example, the book has a great section on the meaning of "NULL" which is used in a lot of "trick" questions.It might not give you all possible examples of where "NULL" can be used in a question, but it does give you a good understanding of what "NULL" means in the SQL context and therefore how to answer questions that could be affected by "NULL" in their code. Manage a flexible, highly available Oracle database with help from the expert information contained in this exclusive Oracle Press guide. 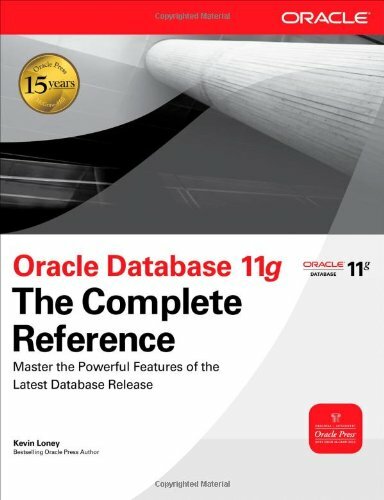 Fully revised to cover every new feature and utility, Oracle Database 11g DBA Handbook shows how to perform a new installation, upgrade from previous versions, configure hardware and software for maximum efficiency, and employ bulletproof security. You will learn to automate the backup and recovery process, provide transparent failover capability, audit and tune performance, and distribute your enterprise databases with Oracle Net. The book was shipped in a timely manner. The item looks new as described by the seller. Good customer service. It has been pretty helpful so far. I've been using it to help me when writing PL/SQL stored procedures on an 11g database. This book is good for beginner and intermediate users.When I bought the book last year, I was intermediate SQL and beginner Oracle.On my previous database projects, I used SQL Server and Sybase and used GUIs to create my tables and relationships.My current project requires PL/SQL scripts that can be run in batch.Since I had done a lot of DML (Data Manipulation Language, e.g., SELECT), little DDL (Data Definition Language, e.g., CREATE TABLE), and virtually no Oracle, I needed help!This book rescued me. This is now my main reference for SQL, and especially Oracle-specific SQL. It has many examples of SQL for specific basic tasks.Not system administration tasks, mind you, but DML and DDL.These examples are the biggest strength.Oracle's syntax flowcharts and O'Reilly's "SQL In A Nutshell" are fine, but I need examples. "Show me". One last note: the book is a SQL book, not a PL/SQL book.If you need to do PL/SQL you will need another PL/SQL-specific book. It's a great reference book. it has nice examples for a beginner. would highly recommend for beginner/intermediate users. Need to find a better book. 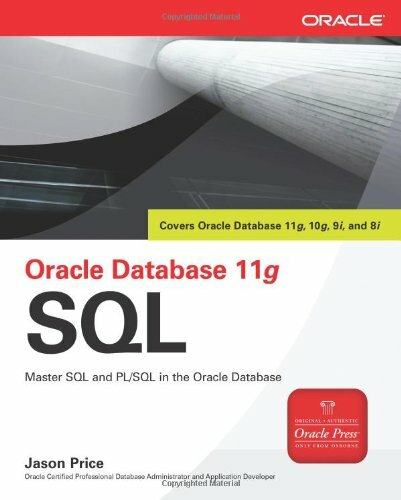 This is probably one of the worst books you can find for Oracle 11g PL/SQL. With so many typos all over the book, Reading this is not going to be very pleasant. The author could have tried to save the reader's time by avoiding redundant information. For instance he explains about CLOB in few pages and when he comes to explain BLOB, it's just Copy paste CLOB explanation, Find the word 'CLOB' and replace with 'BLOB'. 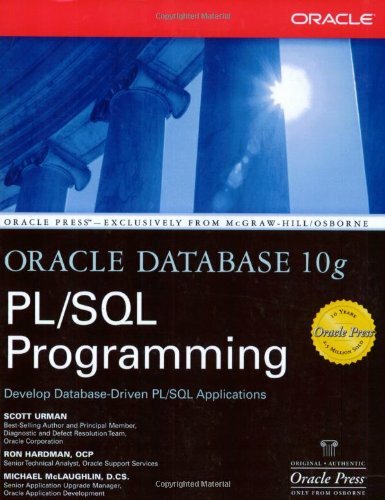 Though this book is not meant to help you pass the Oracle PL/SQL exam, I guess a good technical book should have exercises, but this one does not. 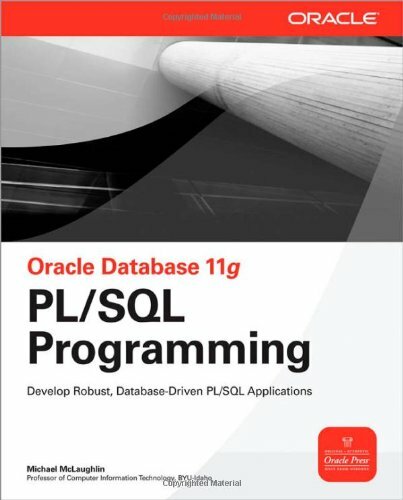 The irony is this one of the very few books available for Oracle 11g PL/SQL programming. This book is full of coding errors and incomplete descriptions of the tasks required to implement PL/SQL.I think the author assumes that the reader already knows a lot about PL/SQL.In addition, there are many code and text errors. I do not know the other people who gave this book such glowing reviews, but most of them must have some previous knowledge of PL/SQL and have learned to accept the fact that many publishing companies do not take the required steps to insure the accuracy of their texts.This is the first time I purchased a book from Oracle Press. And maybe the last. I have been working with PL/SQL for several years and I am now preparing for an OCP exam. I find the style of McLaughlin's book not well suited for exam preparations. Some parts of the text are a bit confusing, occasionally he introduces terms without explaining them, on the other hand he presents the same definitions multiple times in every new section. Lot of important details are never mentioned while some rarely used features get a lot of attention. Also the examples are not all error free. I have put this book aside and use for my preparations the slightly dated "OCP Developer PL/SQL Program Units Exam Guide" from Steve O'Heran. This book is much better suited for an exam preparation. I will only look up the new features in McLaughlin's book. This is the first technical/computing book that I have ever read cover to cover. In fact I read this book cover to cover with multiple iterations of chapters that were difficult for me (e.g., Chapter 6 Functions and Procedures, Chapter 8 Large Objects, Chapter 13, External Procedures, Chapter 14 Object Types and the PHP/Java Primers in Appendices C and D, respectively). I have been a PL/SQL Developer for over 6 years. I thought I was doing pretty well but it turns out I was doing a limited number ofthings in my development experience over and over again. The ease with which I was writing functions and procedures, organizing the same in packages and utilizing a very few of the more advanced features like BULK COLLECT and BULK UPDATE was a deceptive set of convenient facts: Thanks to this book I now know how much I didn't know and I have a more than vague feeling that even now my ship is still relatively close to shore. There is much more the the "sea of PL/SQL", if you'll allow me that much of a poetic license! I was particularly surprised to find out how little I knew about Oracle functions after having written so many over the years. Pipelined functions? I had never heard of them! Creation options? Eh...those either! I did not know you could used mixed notation to make a call to a procedure with multiple parameters. The book has some typographical/copy and paste-type issues which threw me off in the beginning. It's likely not the book as much as it is my personality: I'm a classically trained musician from another life (a MUCH younger life) so you can imagine that I might be predisposed to being a stickler for details. In the end, I finished this book because it was thorough, clear, deep (the way I like it!) and had great continuity (I am easily confused so this is important to me!). One of the most frustrating parts of reading techinical books for me has been when the book begins an example, abandons the example and then starts a new one without the author saying something to the effect of, "In this *new* example..." or "I'll use a different example to demonstrate...". The examples in this book are so continuous that those statements are never even needed. Mr. McLaughlin very courteously (in my opinion) allows readers to benefit from a well-thought plan (apparently!) of moving smoothly from one technical issue to the next by extending an already developed example. I find this feature to be very reassuring and conducive to quick learning. I mean, code is hard enough to read by itself; much more so when the context of the code switches from page to page or randomly 2,3,4 or 5 pages into an issue. The way Mr. McLaughlin makes use of code examples in this book is very helpful, too, because it allows the reader to better understand how one technical issue is related to another. As an example: how to use Virtual Directories is included in the chapter on Large Objects. Now, one wouldn't necessarily *only* use Virtual Directories with Large Objects, but it does make sense, and having the subject placed there helps me understand the most common (I assume) real-world application of Virtual Directories. I would say that this has been an excellent resource for me as a cover-to-cover read and I have already used it as a reference manual so I am sure it works well in that way also. I hope your experience with this book is as good as mine has been. Many congratulations and my deepest appreciation to this author! My first technical book ever! This is a huge accomplishment for me (and the author!)! !.